^ "Istanbul shopping area hit by suicide bomber". BBC. 19 March 2016. ^ "Istanbul explosion: Suicide bomber had ISIS links, says Turkey's interior minister". CNN. 20 March 2016. 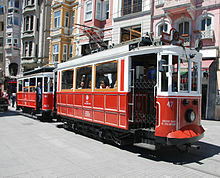 ^ "Istanbul explosion: At least five dead as tourist shopping area Istiklal Street hit by suicide bombing in Turkey". The Independent. 19 March 2016. 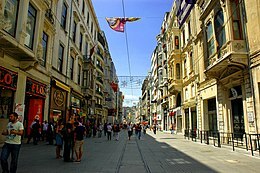 Wikimedia Commons has media related to İstiklal Caddesi.